We present a protocol for the construction of thioether/vinyl sulfide-tethered helical peptides using photo-induced thiol-ene/thiol-yne hydrothiolation. Shi, X., Liu, Y., Zhao, R., Li, Z. Constructing Thioether/Vinyl Sulfide-tethered Helical Peptides Via Photo-induced Thiol-ene/yne Hydrothiolation. J. Vis. Exp. (138), e57356, doi:10.3791/57356 (2018). Here, we describe a detailed protocol for the preparation of thioether-tethered peptides using on-resin intramolecular/intermolecular thiol-ene hydrothiolation. In addition, this protocol describes the preparation of vinyl-sulfide-tethered peptides using in-solution intramolecular thiol-yne hydrothiolation between amino acids that possess alkene/alkyne side chains and cysteine residues at i, i+4 positions. Linear peptides were synthesized using a standard Fmoc-based solid-phase peptide synthesis (SPPS). Thiol-ene hydrothiolation is carried out using either an intramolecular thio-ene reaction or an intermolecular thio-ene reaction, depending on the peptide length. In this research, an intramolecular thio-ene reaction is carried out in the case of shorter peptides using on-resin deprotection of the trityl groups of cysteine residues following the complete synthesis of the linear peptide. The resin is then set to UV irradiation using photoinitiator 4-methoxyacetophenone (MAP) and 2-hydroxy-1-[4-(2-hydroxyethoxy)-phenyl]-2-methyl-1-propanone (MMP). The intermolecular thiol-ene reaction is carried out by dissolving Fmoc-Cys-OH in an N,N-dimethylformamide (DMF) solvent. This is then reacted with the peptide using the alkene-bearing residue on resin. After that, the macrolactamization is carried out using benzotriazole-1-yl-oxytripyrrolidinophosphonium hexafluorophosphate (PyBop), 1-hydroxybenzotriazole (HoBt), and 4-Methylmorpholine (NMM) as activation reagents on the resin. Following the macrolactamization, the peptide synthesis is continued using standard SPPS. In the case of the thio-yne hydrothiolation, the linear peptide is cleaved from the resin, dried, and subsequently dissolved in degassed DMF. This is then irradiated using UV light with photoinitiator 2,2-dimethoxy-2-phenylacetophenone (DMPA). Following the reaction, DMF is evaporated and the crude residue is precipitated and purified using high-performance liquid chromatography (HPLC). These methods could function to simplify the generation of thioether-tethered cyclic peptides due to the use of the thio-ene/yne click chemistry that possesses superior functional group tolerance and good yield. The introduction of thioether bonds into peptides takes advantage of the nucleophilic nature of cysteine residues and is redox-inert relative to disulfide bonds. The development of ligands to modulate protein-protein interactions (PPIs) provides an attractive approach for modern drug discovery. Thus, a great deal of effort has been invested into studying novel chemical modalities that could efficiently modulate PPIs1,2,3. PPIs generally consist of shallow, large, and/or discontinued interacting surfaces, and small molecules are typically considered to be unsuitable ligands for the modulation of PPIs4,5. With a suitable exposed interacting surface area, short peptides that mimic the structural features of protein interfaces represent ideal candidates to address this problem6,7. However, short peptides are typically unstructured in an aqueous solution. This is due to the fact that water molecules which compete with the intramolecular hydrogen bonding network of the peptide backbone and well-defined conformations are entropically unfavorable in water8. In addition, the peptides' inherently low stability and cell permeability properties largely limit their use in biological applications9,10. According to the protein data bank (PDB) analysis, >50% of PPIs involve short α-helix interactions11. Thus, different chemical methods have been developed in regard to helix stabilization. These include disulfide/thioether bond formation12,13,14, ring-closing metathesis15, lactam ring formation16, "click" chemistry17, addition of perfluoroarenes18,19, and vinyl-sulfide formation20. Stabilized helical peptides are widely utilized for various intracellular targets, including p53, estrogen receptors, Ras, BCL-2 family proteins, and others21,22,23,24. ALRN-6924, an all-hydrocarbon stapled peptide dual inhibitor of MDM2 and MDMX, is currently being used for clinical investigation25. In the past few years, our group has focused on the development of novel peptide stabilization methods using thiol-ene and thiol-yne reactions26,27,28. In general, we have demonstrated that these photo-initiated reactions are efficient under mild conditions when naturally abundant cysteine is used. In addition, we have shown that these reactions have an excellent functional group tolerance, are bio-orthogonal, and have been proven to be applicable for peptide and protein modifications29. The resulting thioether/vinyl sulfide tethered peptides largely improve the chemical space of constraint peptides, provide a labile on-tether modification center, and is proven to be applicable for uses in numerous biological applications30,31,32. To date, only limited reports have been described regarding thiol-ene/thiol-yne peptide cyclization. In a study published by Anseth et al. in 2009, an on-resin intramolecular thiol-ene reaction for peptide cyclization between activated alkenes with cysteine was demonstrated33. In 2015, Chou et al. described a two-component radical initiated thiol-ene reaction for peptide stapling34 and a subsequent, sequential thiol-yne/ene coupling reaction35. Recently, we described a series of work based on thioether/vinyl sulfide tethered peptides20,26,27. This protocol describes a detailed synthesis of the above-mentioned thioether/vinyl sulfide tethered peptides in hope that it will be helpful for the broader research community. For the manual peptide-synthesis apparatus, place a vacuum manifold (Table of Materials) in an efficient fume hood. Next, place three-way stopcocks onto the vacuum manifold and connect them to a nitrogen or argon gas line. Cap all unused inlets using rubber septa. Connect resin-filled columns (0.8 x 4 cm, 10-mL reservoir, see Table of Materials) to the manifold using the three-way stopcocks (Figure 1). Use a pump connected to a vacuum system as vacuum filtration or a rubber pipette bulb by extruding to remove the solvent in the columns. Use a photoreactor (Figure 2), equipped with ten 350 nm lamps (Table of Materials) for UV irradiation. Connect these to an argon gas tank via the photoreactor air inlet to ensure that the photoreactor is filled with argon gas prior to and during the photoreactions. Before switching on the UV lamp of the photoreactor, ensure that the photoreactor door is closed in case there is irradiation from the UV light. NOTE: In general, the construction of peptide substrates is carried out using Fmoc-based solid-phase peptide synthesis protocols. These are carried out using the rink amide resin which leaves a C-terminal amide remaining following peptide cleavage. This protocol is used throughout the paper. CAUTION: N,N-dimethylformamide (DMF), dichloromethane (DCM), 4-methylmorpholine (NMM), and N,N-diisoproylethylamine (DIPEA) are toxic and harmful by inhalation, ingestion, or skin contact. Diethyl ether is highly flammable. Trifluoroacetic acid (TFA) is corrosive. 1,2-ethanedithiol (EDT) is highly malodorous. Therefore, all organic solvents and chemicals should be handled with appropriate personal protective equipment (nitrile gloves, lab coat, and protective eyeglasses) and handled inside a chemical fume hood. E.g., the amount of rink amide MBHA resin (0.5 mmol/g) for 25 µmol = 0.025 mmol / (0.5 mmol/g 1,000 mg/g) = 50 mg. Next, weigh 50 mg of resin in a column and set it up on the vacuum manifold using three-way stopcocks. Add 1 - 2 mL of DCM to the resin in a column (0.8 x 4 cm, 10-mL reservoir). To swell the resin, gently agitate it using a nitrogen or argon stream for 10 min. Next, remove the solvent using vacuum filtration. Prepare the N-terminal Fmoc deprotecting solution: prepare an adequate volume (200 mL) of 50% (v/v) morpholine in DMF in a glass bottle. Add 1 - 2 mL of the deprotection solution to the resin, gently agitate it for 10 min and then drain the solution using a vacuum. Using DMF (1 - 2 mL) and DCM (1 - 2 mL) in that order, wash the resin and the reaction vessel thoroughly for a total of 3x. Next, repeat the deprotection and wash procedures 1x. Using the coupling of alanine residue as an example, in the case of a 25 µmol-scale manual synthesis, weigh Fmoc-Ala-OH (5 equiv., 41.4 mg), 2-(6-chloro-1H-benzotriazole-1-yl)-1,1,3,3-tetramethylaminium hexafluorophosphate (HCTU; 4.9 equiv., 50.5 mg) in a polypropylene container and dissolve it in DMF (0.5 mL). Add DIPEA (10 equiv., 43.5 µl) in order to generate a 0.25-M activated amino acid solution ( Table 1). Following an approximate 1 min pre-activation, add the solution to the resin, and then bubble it with N2 for approximately 1 - 2 h.
From this step on, incorporate each amino acid in the peptide chain as a sequence of steps: first the deprotection of the N-terminal Fmoc-group, and then the washing, followed by the coupling of the amino acid via activation using HCTU. NOTE: A longer coupling time (e.g., 2 h) is recommended if coupling following a sterically hindered amino acid residue [e.g., Fmoc-Thr(tBu)-OH, Fmoc-Cys(Trt)-OH, Fmoc-His(Trt)-OH, Fmoc-Arg(Pbf)-OH]. The alkene/alkyne bearing un-natural amino acids are used in 3 equivalents instead of 5 and are left to react for 3 h.
Monitor the peptide synthesis progress using Kaiser or chloranil tests as described by Arora et al.36 These tests provide qualitative assessments of the presence or absence of free primary and secondary amines. Alternatively, approximately 2 - 3 mg of the peptide can be cleaved from the resin and analyzed by LC-MS.
Construct thioether linker through on-resin cyclization (Figure 3). Prepare approximately 50 mL of the Trt deprotection solution (TFA/TIS/DCM 0.03/0.06/1.0). Treat the Cys- and mS5-bearing resin [NH2-R-mS5-A-A-A-Cys(Trt)-R'-resin, 50 mg] with 1 - 2 mL of the Trt deprotection solution in a 10-mL column. Gently agitate the solution for 10 min using N2. Finally, wash it with DCM (1 -2 mL) for a total of 3x. NOTE: MS5 represents the alkylene-bearing building block (see the structure depicted in Figure 6) used for peptide coupling and thio-ene cyclization38. Repeat the procedure described above for a total of approximately 6x in order to remove the trityl protection group of cysteine, until the solution color is no longer yellow. Bubbled with N2, wash the R-mS5-A-A-A-Cys(-SH)-R'-resin [cysteine with free thio (-SH)] with DMF (1 - 2 mL) and DCM (1 - 2 mL) in that order. Shrink the resin using methanol (1 - 2 mL) for 2 min and then remove the solvent using filtration. Next, sequentially dry the resin under a steam of N2 gas for approximately 5 min in the column. Prepare degassed DMF beforehand, within a mouth flask, by bubbling nitrogen gas for approximately 1 h through a long needle that was stretched into the solvent. Transfer the resin into a 10-mL round-bottomed flask through weigh paper. Suspend the resin in 2 mL of the degassed DMF followed by the addition of the photoinitiator 2-hydroxy-1-[4-(2-hydroxyethoxy)-phenyl]-2-methyl-1-propanone (MMP; 1 equiv., 5.6 mg), 4-methoxyacetophenone (MAP; 1 equiv., 3.8 mg). Add a stir bar (0.3 cm) into the flask and cap the flask with a suitable rubber plug, then displace the air in the flask with nitrogen gas using an oil pump. NOTE: The inert atmosphere is not strictly required for the effective thio-ene photoreaction on a solid phase. However, it is very necessary for the thio-yne photoreaction in solution phase in Figure 5. Otherwise, sulfur will oxidize during the UV irradiation. Set the reaction flask into the photoreactor and stir the resin for 1 h under UV irradiation at room temperature (Figure 2). CAUTION: Prior to switching the photoreactor UV lamp on, ensure that the photoreactor door is closed in case there is harmful irradiation from the UV light. NOTE: Frequently sampling the reaction mixture during the photoreactions is recommended for new sequences, as the linear peptide precursor has the identical molecular weight of the product. In general, linear and cyclic peptides display significantly different hydrophilicity. This could be easily distinguished using HPLC. Alternatively, the 5,5'-dithiobis-(2-nitrobenzoic acid) (DTNB) reagent could also be used to study the presence of free thiol37. Transfer the resin from the flask into the column and remove the solvent using vacuum filtration. Wash and dry the resin as described in step 5.1.3. Prepare approximately 10 mL of the cleavage cocktail (TFA/TIPS/EDT/H2O 94/1/2.5/2.5) in the fume hood. Transfer the resin into a 2-mL polypropylene container, add 1 mL of cleavage cocktail (TFA/TIPS/EDT/H2O 94/1/2.5/2.5) to the container, and seal the container tightly using a screw cap. Then, gently agitate the container on an orbital shaker at a rate of 60 rpm in the fume hood for 1.5 - 2 h.
CAUTION: TFA is highly corrosive. Wear protective clothing and work in an efficient fume hood. 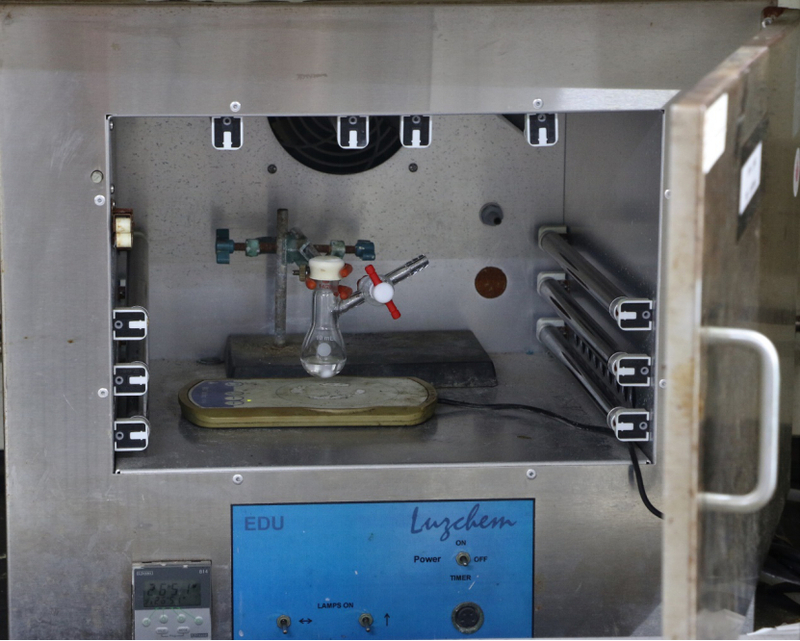 EDT is a highly malodorous substance and must be handled in an efficient fume hood. Remove the TFA cocktail by evaporation under an N2 gas stream in the fume hood. Next, precipitate the residue using cold diethyl ether (1 mL) for 30 s and isolate it via centrifugation at 12,000 x g for 2 min. Following the centrifugation, gently pour the ether component out. Repeat the precipitate and centrifugation steps for 2x. Evaporate the residue to dryness. Finally, dissolve the residue in 1 mL H2O/acetonitrile (2:1) and purify by HPLC using a C18 analytic column (4.6 x 250 mm, flow rate 1.0 mL/min). Use H2O (containing 0.1% TFA) and pure acetonitrile as solvents in a 2%/min linear gradient from 20% to 70% acetonitrile over 25 min. Monitor HPLC spectra using UV 280 nm and 220 nm wavelengths ( Table 2). Construct the thioether linker through intermolecular thio-ene reaction, and then cyclize the peptide by macrolactamization (Figure 4). 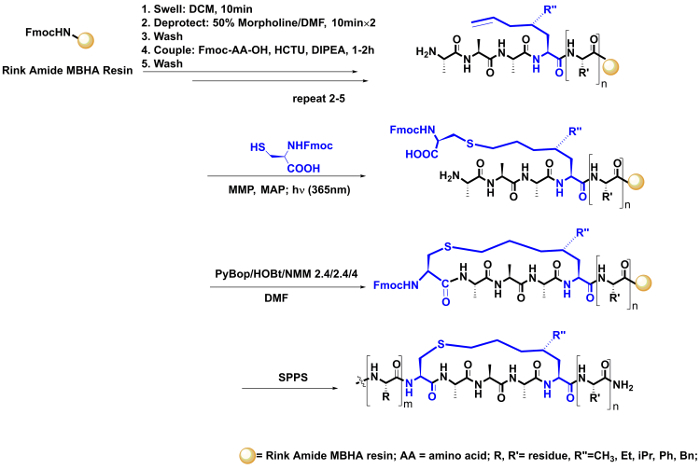 Synthesize the alkylene residue bearing the linear peptide H2N-A-A-A-mS5(2-R'')-R'-resin (50 mg) using standard Fmoc-based solid-phase peptide synthesis (SPPS) as described in steps 2 - 4. Next, wash and dry the resin as described in step 5.1.3. Suspend the resin in a 10-mL round-bottomed flask containing 2 mL of the degassed DMF as described in step 5.1.4. Add the photoinitiator MMP and MAP (MMP: 1 equiv., 5.6 mg; MAP: 1 equiv., 3.8 mg), Fmoc-Cys-OH (3 equiv., 25.7 mg), and a stir bar (0.3 cm) into the flask. Cap the flask using a suitable rubber plug and then use the oil pump to replace the air in the flask with nitrogen. Set the reaction flask into the photoreactor. Stir for 1 - 2 h under UV irradiation at room temperature (Figure 2). Monitor the reaction under an LC-MS analysis: cleave 2 - 3 mg of the resin using the cleavage cocktail. Then precipitate the residue with cold diethyl ether (300 µL), isolate the residue by centrifugation, and evaporate the residue to dryness as described in step 5.1.11. After that, dissolve the residue in 100 µL of H2O/acetonitrile (2:1). Filtrate the peptide solution using a 0.22-µm microporous film and analyze it using LC-MS with the compound ionized in the electrospray ionization (ESI) and operated in positive mode. If necessary, repeat steps 5.2.2 - 5.2.4 to ensure the reaction is carried out to completion. 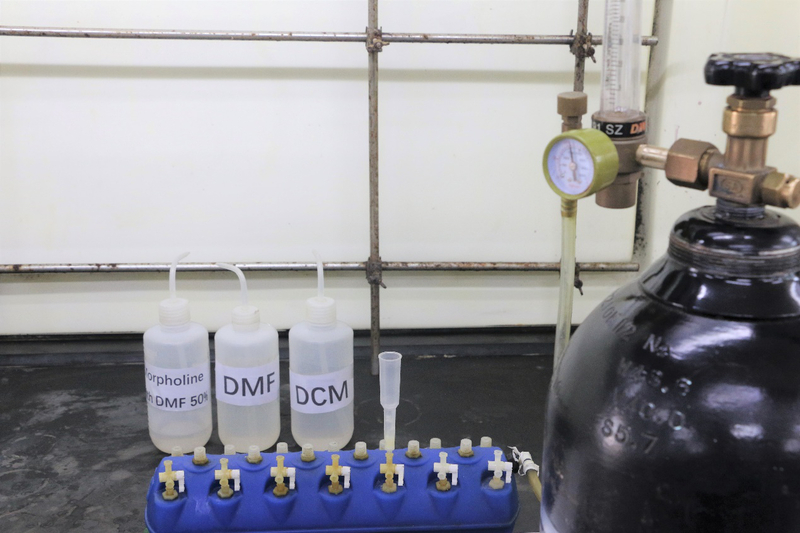 Following the completion of the photo-reaction, transfer the resin from the flask into the column, and remove the solvent using vacuum filtration. Wash and dry the resin as described in step 5.1.3. Add the DMF solution of benzotriazole-1-yl-oxytripyrrolidinophosphonium hexafluorophosphate (PyBob; 2.4 equiv., 31.2 mg), 1-hydroxybenzotriazole (HoBt; 2.4 equiv., 8.1 mg), and NMM (4 equiv., 11 µL) to the resin in the column for the macrolactamization. Bubble this solution with N2 for 2 h.
In addition, monitor this coupling reaction using LC-MS as described in step 5.2.3. If necessary, repeat this step to ensure the reaction is carried out to completion. Elongate the peptide using standard Fmoc-based SPPS as described in steps 3 and 4. Upon assembly of all the amino acid residues, cleave the peptide from the resin as described in steps 5.1.10 and 5.1.11 and purify it as described in step 5.1.12. Construct vinyl sulfide linker in solution phase (Figure 5). Synthesize the alkyne residue bearing linear peptide using standard Fmoc-based SPPS as described in steps 2 - 4. Synthesize the alkyne bearing amino acid according to a well-established protocol as described in a previous study20. Cleave the peptide from the resin and precipitate it using cold diethyl ether as described in steps 5.1.9 - 5.1.11. Following the cleavage and precipitation of the resin, collect the peptide using centrifugation at 12,000 x g for 2 min. Dry the resulting residue in a vacuum. Dissolve the residue in the degassed DMF (50 mL) in a 100-mL round-bottomed flask in order to reach a final concentration of 0.5 mM (based on the loading of the resin, 0.025 mmol (1000 mL/L / 0.5 mmol/L)= 50 mL). Add the photoinitiator DMPA (0.5 equiv., 3.2 mg) and then degas the reaction solution for 10 min using N2 through a long needle stretched into the solution. Next, irradiate the sample under UV light at room temperature for 0.5 - 1 h without agitation. Remove the DMF under a high vacuum and precipitate the crude residue by adding diethyl ether in order to dissolve its organic byproducts. Then, isolate the residue using centrifugation at 12,000 x g for 2 min. Following the centrifugation, gently pour the ether component out. Evaporate the residue to dryness. Finally, dissolve the residue in 1 mL of H2O/acetonitrile (2:1) and purify it using HPLC as described in step 5.1.7. 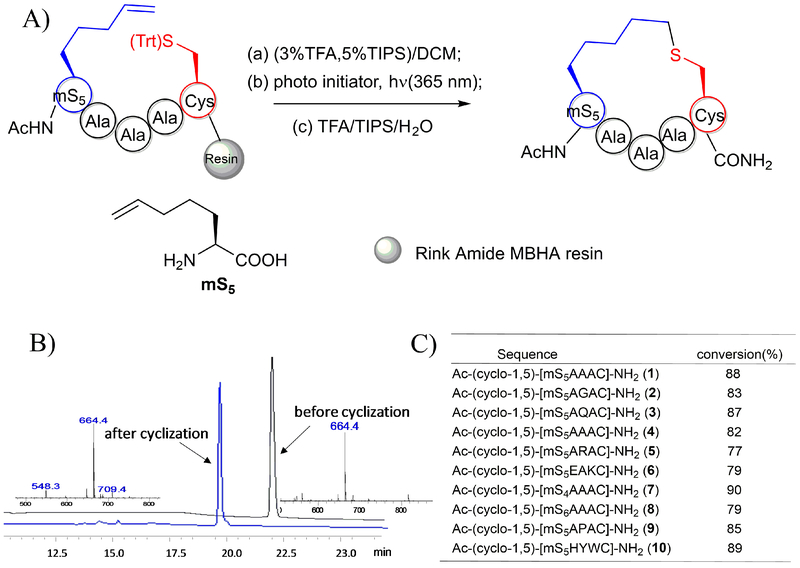 The HPLC and MS spectra of the peptide Ac-YmS5AAAC-NH2 and its cyclized product Ac-Y-(cyclo-1,5)-[mS5AAAC]-NH2 that were generated using the on-resin intramolecular thiol-ene photoreaction are depicted in Figure 6B. The cyclic peptide was found to have an identical molecular weight relative to its linear precursor. However, its HPLC retention time was observed to be approximately 2 min earlier than that of its precursors under the same separation conditions. Short peptides with different sequences were all observed to have a good conversion, as depicted in Figure 6C. The screening process for the thio-yne photoreaction conditions is depicted in Figure 7B, and the isomer conversion and ratio were determined using the integration of reverse-phase HPLC. Only trace levels of peptide 2c were observed following UV irradiation. This is likely due to a conformational preference for a trapping of the thiyl radical at the N-terminus during the contracting step to a 20-membered macrocycle. Both peptides 1a and 1b were found to generate two isomers with an 8-member vinyl sulfide crosslink. Peptides 2a-A and 2a-B, which were generated from peptide 1a, exhibited distinct retention times as well as different ratios for different UV irradiation times (0 - 30 min) (Figure 7C). These were assigned as the E/Z isomers due to the double bond proton signals on the 1H-NMR spectroscopy (Figure 7D). In the case of peptides 2d-2f, the Z-isomer was found to be the dominant product. This is likely due to the conformational preference during the construction of a compact structure relative to the 8-member vinyl sulfide crosslink. As depicted in Figure 7E, according to the circular dichroism (CD) spectrum, peptides 2a-A/B and 2b-A/B that possess an 8-member vinyl sulfide crosslink exhibit a random coil, while peptide 2d that possesses a 7-member vinyl sulfide crosslink exhibits a helical conformation. In summary, the Z-isomer of the vinyl sulfide bond was found to be formed preferentially and displayed a better helix induction. Figure 1: Manual peptide-synthesis apparatus for solid phase peptide synthesis. The columns were placed on the vacuum manifold through the three-way stopcocks and the apparatus was connected to a nitrogen or argon gas line for the bubbling. Please click here to view a larger version of this figure. Figure 2: The photoreactor device used for the photoreactions. The device was equipped with ten 350 nm lamps (Table of Materials) for UV irradiation and an argon gas tank to ensure that the photoreactor was filled with argon gas prior to and during the photoreactions. Please click here to view a larger version of this figure. Figure 3: On-resin intramolecular thiol-ene reaction in the case of shorter peptides. This reaction was carried out using an on-resin deprotection of the trityl groups of cysteine residues following the complete synthesis of the linear peptide and then set the resin to the UV irradiation using the photoinitiators MAP and MMP. Please click here to view a larger version of this figure. Figure 4: On-resin intermolecular thio-ene reaction. This reaction was carried out by dissolving Fmoc-Cys-OH in the DMF solvent and then irradiated with the alkene-bearing peptide residue on the resin, followed by a macrolactamization using PyBop, HoBt, and NMM as activation reagents. Then the peptide synthesis was continued using a standard SPPS. Please click here to view a larger version of this figure. Figure 5: Intramolecular thiol-yne reaction in solution phase. This reaction was carried out in the solution phase following the complete synthesis of the linear peptide, after which the linear peptide was dissolved in degassed DMF and irradiated using UV light with the photoinitiator DMPA. Please click here to view a larger version of this figure. Figure 6: Thioether tethered cyclic peptides generated using an on-resin intramolecular thiol-ene reaction. A. This panel shows the scheme of the on-resin intramolecular thio-ene reaction. mS5: "m" represents the mono-substituted olenic amino acids, "S" represents the S configured amino acid, and "5" refers to the number of side chain atoms38. B. This panels shows the HPLC and MS spectra of the peptide Ac-YmS5AAAC-NH2 prior to and following its cyclization. C. This panel shows the conversion of the cyclic peptides with different sequences. This figure has been modified from Zhao, B. et al.28 Please click here to view a larger version of this figure. Figure 7: Peptide stapling through photo-induced thiol-yne hydrothiolation. A. This is a schematic illustration of intramolecular thiol-yne hydrothiolation. B. This panel shows the peptide sequences evaluated in this study. Initiator: (I) 0.5 eq. DMPA, 1 h; (II) no initiator, 1 h; (III) 0.5 eq. DMPA, 0.5 eq. MAP, 1 h; (IV) 0.5 eq. MMP, 0.5 h. C. This panel shows the HPLC traces of the reaction mixture of peptide 1a with different UV irradiation times and monitored at 220 nm. D. This panel shows the 1H-NMR spectra of 1a, 2a-A, and 2a-B (measured in DMSO-d6 at 400 MHz). The asterisks indicate the formation of a vinyl sulfide double bond following UV irradiation. E. This panel shows the circular dichroism spectra of peptides with vinyl sulfide cross-links. This figure has been modified from Tian, Y. et al.44 Please click here to view a larger version of this figure. Table 1: The amounts of the coupling conditions. Table 2: High-performance liquid chromatography conditions. In the on-resin intramolecular thio-ene cyclization described in Figure 3, the removal of the trityl group of a cysteine residue was found to be a critical step for the subsequent photoreaction. In addition, the peptide molecular weight prior to and following the reaction was found to be identical as depicted in Figure 6B. Therefore, the use of an HPLC identification or a DTNB assay is required in order to monitor the reaction. In the case of the intermolecular thio-ene reaction described in Figure 4, MS monitoring is necessary. While a further step of lactam coupling was found to be required for the construction of a thioether tether, we suggest that this protocol will be used for long peptides in order to achieve an overall higher efficiency. The vinyl sulfide bond generated by the thio-yne photoreaction was not stable in the strongly acidic TFA solution that is used for resin cleavage. Therefore, the use of the thio-yne photoreaction in the solution phase was adopted. This reaction was diluted to a low concentration (0.5 mM) in order to avoid potential intermolecular by-reactions. It is also equally important to degas the solvent in order to avoid product oxidation during the photoreactions. Following the reaction, vacuum evaporation of the organic solvent DMF should also be carefully carried out in order to prevent peptide oxidation/degradation or machinery depreciation. The thio-yne cyclization reaction depicted in Figure 5 provides a mechanism for post-peptide synthesis modification35. While the intramolecular thiol-ene reaction successfully generated thioether tethered peptides with good conversion, a simple thioether cross-link failed to constrain the peptides into the desired helical conformation. Based on this on-tether modification strategy, an in-tether chiral center induced peptide helicity concept was developed, where the γ substituted group with the R configuration at the peptide C-terminal was able to induce the peptide's helical conformation (Figure 4)39,40. The limitation associated with this approach is the synthesis of the enantiomerically pure unnatural amino acid with two chiral centers (α(S), γ(R))41,42. This research demonstrated that the thio-yne reaction can constrain the peptide into a helical conformation with good conversion, as depicted in Figure 7E. In terms of the construction of helical peptides, we recommend thio-yne photoreaction for the construction of helical peptides. The on-resin intramolecular thio-ene cyclization was demonstrated to be suitable for the construction of short thioether tether peptides (less than 15) in case long peptides are too flexible to ensure effective cyclization. In addition, the on-resin intermolecular thio-ene cyclization is recommended for long peptide cyclization. In summary, we have developed a series of chemical protocols for the construction of thioether/vinyl sulfide tethered peptides through the use of photoinduced thio-ene/thio-yne click chemistry. The reaction is efficient, metal catalyst-free, convenient for manipulations, and has been demonstrated to possess a superior functional group tolerance and bio-orthogonal. Further, this method was developed in order to stabilize other peptide secondary structures such as a β-hairpin43,44. This paper shows that the thioether tether provides a traceless modification site. This largely expands the chemical space following peptide synthesis modification. Furthermore, the aliphatic thioether/vinyl sulfide tethered peptides that exhibited a reduced membrane toxicity relative to the hydrocarbon staple peptides are applied in diverse biological applications with demonstrated good bioactivity and bioavailability45,46. The authors acknowledge financial support from the Natural Science Foundation of China Grants (No. 21372023, 21778009 and 81701818); the Ministry of Science and Technology of the People's Republic of China (No. 2015DFA31590); the Shenzhen Science and Technology Innovation Committee (No. JCYJ20170412150719814, JCYJ20170412150609690, JCYJ20150403101146313, JCYJ20160301111338144, JCYJ20160331115853521, JSGG20160301095829250, and GJHS20170310093122365); and the China Postdoctoral Science Foundation (No. 2017M610704). 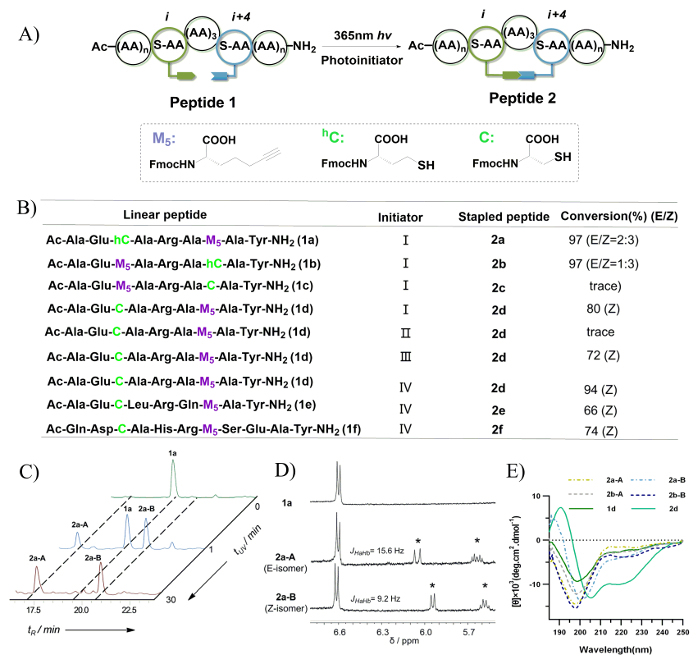 Standard Fmoc-protected amino acids GL Biochem (Shanghai) Ltd.
Pelay-Gimeno, M., Glas, A., Koch, O., Grossmann, T. N. Structure-based design of inhibitors of protein-protein interactions: mimicking peptide binding epitopes. Angewandte Chemie International Edition. 54, (31), 8896-8927 (2015). Passioura, T., Katoh, T., Goto, Y., Suga, H. Selection-based discovery of druglike macrocyclic peptides. Annual Review of Biochemistry. 83, 727-752 (2014). Gonzalez, M. W., Kann, M. G. Protein interactions and disease. PLoS Computational Biology. 8, (12), 1-11 (2012). Wilson, A. J. Inhibition of protein-protein interactions using designed molecules. Chemical Society Reviews. 38, (12), 3289-3300 (2009). Teresa, A. F. C., Alessio, C. Cyclic and macrocyclic peptides as chemical tools to recognise protein surfaces and probe protein-protein interactions. ChemMedChem. 11, (8), 787-794 (2016). Craik, D. J., Fairlie, D. P., Liras, S., Price, D. The future of peptide-based drugs. Chemical Biology & Drug Design. 81, (1), 136-147 (2013). Cromm, P. M., Spiegel, J., Grossmann, T. N. Hydrocarbon stapled peptides as modulators of biological function. ACS Chemical Biology. 10, (6), 1362-1375 (2015). Zhang, Q. Z., Tian, Y., Lao, Y. Z., Li, Z. G. Peptides-staple method development and its application in cancer therapy. Current Medicinal Chemistry. 21, (21), 2438-2452 (2014). Wang, D., Liao, W., Arora, P. S. Enhanced metabolic stability and protein-binding properties of artificial alpha helices derived from a hydrogen-bond surrogate: application to Bcl-xL. Angewandte Chemie International Edition. 44, (40), 6525-6529 (2005). Bullock, B. N., Jochim, A. L., Arora, P. S. Assessing helical protein interfaces for inhibitor design. Journal of the American Chemical Society. 133, 14220-14223 (2011). Jackson, D. Y., King, D. S., Chmielewski, J., Singh, S., Schultz, P. G. General approach to the synthesis of short α-helical peptides. Journal of the American Chemical Society. 113, (24), 9391-9392 (1991). Timmerman, P., Beld, J., Puijk, W. C., Meloen, R. H. Rapid and quantitative cyclization of multiple peptide loops onto synthetic scaffolds for structural mimicry of protein surfaces. ChemBioChem. 6, (5), 821-824 (2005). Muppidi, A., Wang, Z., Li, X., Chen, J., Lin, Q. Achieving cell penetration with distance-matching cysteine cross-linkers: a facile route to cell-permeable peptide dual inhibitors of Mdm2/Mdmx. Chemical Communications. 47, (33), 9396-9398 (2011). Schafmeister, C. E., Po, J., Verdine, G. L. An all-hydrocarbon cross-linking system for enhancing the helicity and metabolic stability of peptides. Journal of the American Chemical Society. 122, (24), 5891-5892 (2000). Osapay, G., Taylor, J. W. Multicyclic polypeptide model compounds. 1. synthesis of a tricyclic amphiphilic alpha-helical peptide using an oxime resin, segment-condensation approach. Journal of the American Chemical Society. 112, (16), 6046-6051 (1990). Lau, Y. H., Andrade, dP., Wu, Y., Spring, D. R. Peptide stapling techniques based on different macrocyclisation chemistries. Chemical Society Reviews. 44, (1), 91-102 (2015). Spokoyny, A. M., Zou, Y., Ling, J. J., Yu, H., Lin, Y. S., Pentelute, B. L. A perfluoroaryl-cysteine S(N)Ar chemistry approach to unprotected peptide stapling. Journal of the American Chemical Society. 135, (16), 5946-5949 (2013). Lautrette, G., Touti, F., Lee, H. G., Dai, P., Pentelute, B. L. Nitrogen arylation for macrocyclization of unprotected peptides. Journal of the American Chemical Society. 138, (27), 8340-8343 (2016). Tian, Y., et al. 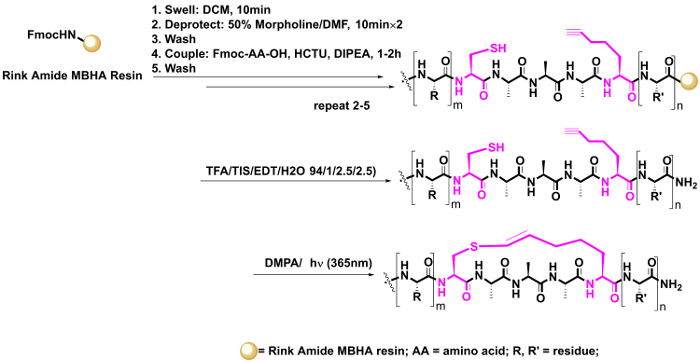 Stapling of unprotected helical peptides via photoinduced intramolecular thiol-yne hydrothiolation. Chemical Science. 7, (5), 3325-3330 (2016). Chang, Y. S., et al. Stapled α-helical peptide drug development: a potent dual inhibitor of MDM2 and MDMX for p53-dependent cancer therapy. Proceedings of the National Academy of Sciences of the United States of America. 110, (36), 3445-3454 (2013). Zhao, H., et al. Crosslinked aspartic acids as helix-nucleating templates. Angewandte Chemie International Edition. 55, (39), 12088-12093 (2016). Leshchiner, E. S., et al. Direct inhibition of oncogenic KRAS by hydrocarbon-stapled SOS1 helices. Proceedings of the National Academy of Sciences of the United States of America. 112, (6), 1761-1766 (2015). Wang, D., Qin, X., Zhao, H., Li, Z. N-cap helix nucleation: methods and their applications. Science China Chemistry. 60, (6), 689-700 (2017). Zorzi, A., Deyle, K., Heinis, C. Cyclic peptide therapeutics: past, present and future. Current Opinion in Chemical Biology. 38, 24-29 (2017). Hu, K., et al. An in-tether chiral center modulates the helicity, cell permeability, and target binding affinity of a peptide. Angewandte Chemie International Edition. 55, (28), 8013-8017 (2016). Lin, H., Jiang, Y., Zhang, Q., Hu, K., Li, Z. An in-tether sulfilimine chiral center induces helicity in short peptides. Chemical Communications. 52, (68), 10389-10391 (2016). Zhao, B., Zhang, Q., Li, Z. Constructing thioether-tethered cyclic peptides via on-resin intra-molecular thiol-ene reaction. Journal of Peptide Science. 22, (8), 540-544 (2016). Dondoni, A., Massi, A., Nanni, P., Roda, A. A new ligation strategy for peptide and protein glycosylation: photoinduced thiol-ene coupling. Chemistry. 15, (43), 11444-11449 (2009). Hu, K., Sun, C., Li, Z. Reversible and versatile on-tether modification of chiral-center-induced helical peptides. Bioconjugate Chemistry. 28, (7), 2001-2007 (2017). Shi, X., Jiang, Y., Yang, D., Zhao, H., Tian, Y., Li, Z. Reversibly switching the conformation of short peptide through in-tether chiral sulfonium auxiliary. Chinese Chemical Letters. In Press (2017). Jiang, Y., et al. Switching substitution groups on the in-tether chiral centre influences backbone peptides' permeability and target binding affinity. Organic & Biomolecular Chemistry. 15, (3), 541-544 (2017). Aimetti, A. A., Shoemaker, R. K., Lin, C. C., Anseth, K. S. On-resin peptide macrocyclization using thiol-ene click chemistry. Chemical Communications. 46, (23), 4061-4063 (2010). 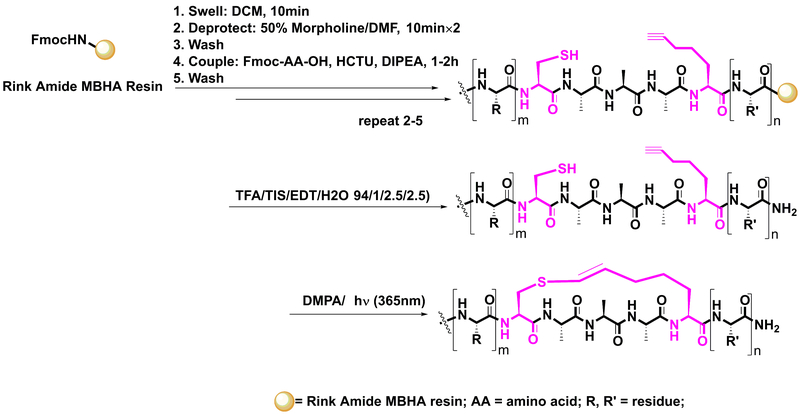 Wang, Y. X., Chou, D. H. C. A thiol-ene coupling approach to native peptide stapling and macrocyclization. Angewandte Chemie International Edition. 54, (37), 10931-10934 (2015). Wang, Y., et al. Application of thiol-yne/thiol-ene reactions for peptide and protein macrocyclizations. Chemistry. 23, (29), 7087-7092 (2017). Patgiri, A., Menzenski, M. Z., Mahon, A. B., Arora, P. S. Solid-phase synthesis of short α-helices stabilized by the hydrogen bond surrogate approach. Nature Protocols. 5, (11), 1857-1865 (2010). Ozyurek, M., Baki, S., Gungor, N., Celik, S. E., Guclu, K., Apak, R. Determination of biothiols by a novel on-line HPLC-DTNB assay with post-column detection. Analytica Chimica Acta. 750, 173-181 (2012). Zhang, Q. Z., et al. Chiral sulfoxide-induced single turn peptide α-helicity. Scientific Reports. 6, 38573 (2016). Lin, H., et al. An in-tether sulfilimine chiral center induces beta-turn conformation in short peptides. Organic & Biomolecular Chemistry. 14, (42), 9993-9999 (2016). Hu, K., Li, W., Yu, M., Sun, C., Li, Z. Investigation of cellular uptakes of the in-tether chiral-center-induced helical pentapeptides. Bioconjugate Chemistry. 27, (12), 2824-2827 (2016). Hu, K., et al. A precisely positioned chiral center in an i, i + 7 tether modulates the helicity of the backbone peptide. Chemical Communications. 53, (50), 6728-6731 (2017). Li, J., et al. An in-tether chiral center modulates the proapoptotic activity of the KLA peptide. Chemical Communications. 53, (75), 10452-10455 (2017). Zhao, B., et al. A thioether-stabilized-D-proline-L-proline-induced β-hairpin peptide of defensin segment increases its anti-Candida albicans ability. ChemBioChem. 17, (15), 1416-1420 (2016). Tian, Y., Yang, D., Ye, X., Li, Z. Thioether-derived macrocycle for peptide secondary structure fixation. The Chemical Record. 17, (9), 874-885 (2017). Hu, K., Yin, F., Yu, M., Sun, C., Li, J., Liang, Y., Li, W., Xie, M., Lao, Y., Liang, W., Li, Z. G. In-tether chiral center induced helical peptide modulators target p53-MDM2/MDMX and inhibit tumor growth in stem-like cancer cell. Theranostics. 7, (18), 4566-4576 (2017). Tian, Y., Jiang, Y., Li, J., Wang, D., Zhao, H., Li, Z. Effect of stapling architecture on physiochemical properties and cell permeability of stapled α-helical peptides: a comparative study. ChemBioChem. 18, (21), 2087-2093 (2017).